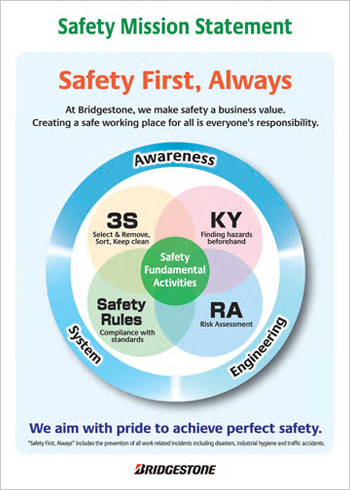 ﻿ Safety Policy | Bridgestone India Automotive Products Pvt.Ltd. Assurance of safety is the fundamental requirement of all operations performed at our workplace. In this respect, a commitment to safety must take priority of overall other business concerns. The assurance of safety also forms the basis of mutual trust among our employees, our communities and all other members associated with the Bridgestone India Automotive Products. It is a priceless attribute that is the foundation of sound business operation. 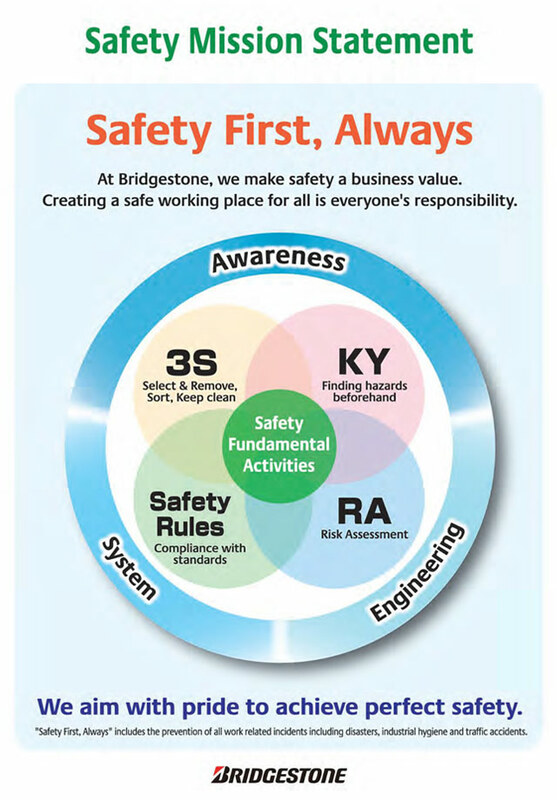 In view of this, we at the Bridgestone India Automotive Products hereby declare our commitment to safety within the workplace and will achieve this through strict adherence to the following Fundamental Safety Policy. We will faithfully comply with all laws and regulations, and governmental guidelines concerning safety. We will establish safe production methods in accordance with international safety standards. We will strive to acquire technologies concerning safety matters, including risk assessment, safety measures and safety management. We will establish an advance risk assessment system and make a continual effort to reduce long-term risks. We will strive to achieve safety through the efforts of each and every employee regardless of rank or occupation. We will continually strive to improve workplace safety by maintaining an open line of dialogue with each and every employee. We will maintain a safe workplace by striving to reduce accidents caused by fire or earthquakes. As a pillar of auto industry, we will strive to develop technologies to enhance traffic safety and reduce traffic accidents.